These commemorative flag cases can be used for a variety of occasions: Military retirement, public service retirement, Eagle Scout and other special recognitions, flags flown over the Capitol building in honor or in memory of your special occasion and, of course, our cases are appropriate for both active-duty and retired military deaths. 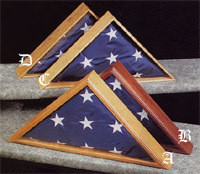 Cherry Memorial Flag Case features a beveled glass front with rear closure. Available with or without gold seal shown in the image here. Recommended for Flag size 5'X9.5'. Choose with or without seal here. This 5' X 9 1/2' Flag conforms to government proportion specifications. Made with natural cotton fiber with embroidered stars and sewn stripes, this Flag is sized for use in funeral ceremonies as a casket covering. It may also be displayed outdoors as any other Flag except during periods of inclement weather. For outdoor display choose all weather Nylon in the pulldown window.